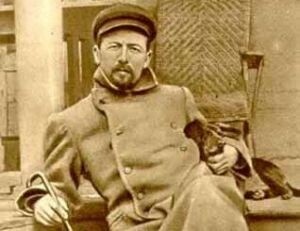 About Anton Chekhov: One of Russia&apos;s greatest writers, Chekhov began his career writing jokes and anecdotes for popular magazines to support himself while he studied to become a doctor. Between 1888 and his death he single-handedly revolutionized both the drama and the short story. Near the end of his life he married an actress, Olga Knipper. He died from tuberculosis in 1904, age 44. About this project: Constance Garnett translated and published 13 volumes of Chekhov stories in the years 1916-1922. Unfortunately, the order of the stories is almost random, and in the last volume Mrs. Garnett stated: "I regret that it is impossible to obtain the necessary information for a chronological list of all Tchehov&apos;s works." This site presents all 201 stories in the order of their publication in Russia. "While she makes elementary blunders, her care in unravelling difficult syntactical knots and her research on the right terms for Chekhov&apos;s many plants, birds and fish are impressive.... Her English is not only nearly contemporaneous to Chekhov&apos;s, it is often comparable." "The reason English-speaking readers can barely tell the difference between Tolstoy and Dostoyevsky is that they aren&apos;t reading the prose of either one. They&apos;re reading Constance Garnett." In her translations, she worked quickly, and smoothed over certain small portions for "readability", particularly in her translations of Dostoyevsky. In instances where she did not understand a word or phrase, she omitted that portion.